For two decades, Books for Babies, an initiative of ALA’s United for Libraries, has provided parents of newborns with resources to engage in early literacy activities with their infants. The kits, available in English and Spanish, include a board book, an application for the child’s first library card, and informational brochures. The importance of early literacy to success in life is well documented; statements and studies to that effect can be found in Power Guide for Successful Advocacy. (See page 27 in Appendix A.) More information on this subject is available on United for Libraries’ Early Literacy page. 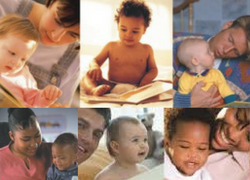 The Babies Need Words Every Day: Talk, Read, Sing, Play public awareness campaign, launched by the Association for Library Service to Children (ALSC), promotes the importance of parent and caregiver communication with babies. Free, customizable resources include posters with simple ideas for boosting children’s language and a book list brochure to support concept and language acquisition. What’s Early Lit for Kids Who Can’t See? includes a resource on Five Early Literacy Practices for Children with Low or No Vision. ALSC Children’s Notable Lists: Each year ALSC identifies the best children’s books, recordings, and videos. The Rainbow Book List was created by the Rainbow Book List Committee of the Gay, Lesbian, Bisexual, and Transgender Round Table of the American Library Association. Originally a joint project between the Gay, Lesbian, Bisexual, and Transgender Roundtable and the Social Responsibilities Round Table, the Rainbow Book List presents an annual bibliography of quality books with significant and authentic GLBTQ content, which are recommended for people from birth through eighteen years of age. REFORMA and ALSC’s 2018 Pura Belpré Award Committee have compiled a list of stories of immigration from Pura Belpré Medal and Honor Books.